One of the lifestyle changes that living in China brings for most Westerners is a newfound tendency to eat out all the time or buy prepared food from a shop or stall rather than cook food at home. 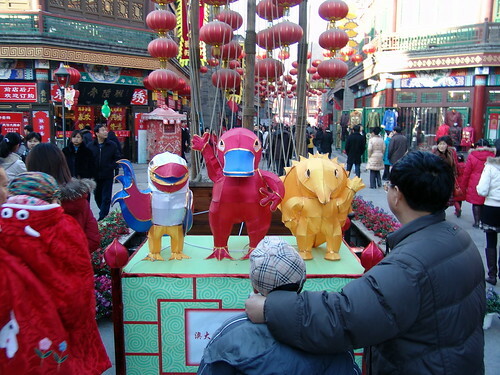 Even if going out for a meal was a once a week tradition for someone back home, odds are that he or she will be going out for meals much more often in China. Note, however, that if you’re one of those foreigners who “doesn’t trust” Chinese restaurants, eating at McDonald’s and KFC will cost you the same as it does back home. Amusingly or not, I’ve met several Europeans who would rather die than eat fast food in their home countries, yet make it a habit to eat McDonald’s regularly while studying or working here. Similarly, a former colleague of mine only eats meat if she’s eating at McDonald’s; otherwise, she sticks to a vegan diet while in China. Another explanation for foreigners eating out most of the time is the high barrier to entry to preparing home cooked meals in China. First, foreigners working as English teachers or studying here may be housed in a school dormitory or small apartment that doesn’t lend itself to cooking. Second, as this post from James Fallows suggests, many foreigners have a hard time buying the things they need in China. For instance, I can’t even find deodorant most of the time, so how am I supposed to pick up the right cheese and spices? 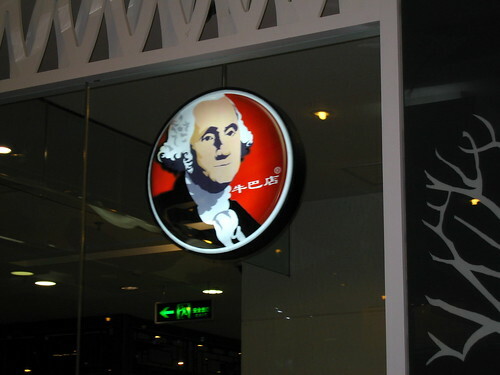 Third, many foreigners are unable to adapt themselves to the cooking styles in China. We have to be prepared to cook with gas, forgo large ovens (unless one happens to be minted), and make due with local spices. But one doesn’t have to be Liu Xiang to jump over these home cooking hurdles in China. * The easy way out is to have a Chinese significant other who can do all the cooking for you, but this is cheating. Another way to cheat is by buying frozen dishes and frying or microwaving them, though in the end you may wind up using a lot of sauces to make eating worthwhile. ** A better solution is to learn local cooking, either from a Chinese teacher or from the Internet, though most recipes will need to be adjusted for the materials on-hand. (Strangely, many “Chinese” recipes on the Internet use ingredients not found in China.) The most expensive solution would be to buy imported goods from an international supermarket and cook Western food. Unfortunately, most of these products have an import premium that makes them cost 50-200% more than what we pay back home. Beyond all of this, you will need to make an investment in spices and seasonings, household appliances, dishes, cookware, and cooking utensils. The price of flavorings will vary according to what you want. Asian spices like ground red pepper, five spice, Sichuan peppercorn, and (gulp) MSG cost next to nothing, but imported seasonings like oregano and cinnamon sugar will run 30-50 RMB per bottle. As for appliances, most foreigners will get a gas stove and microwave with their apartment, but a few other things need to be bought. A toaster oven can be bought for 150-200 RMB, and a rice cooker runs for 100-300 RMB (but you can use the microwave if you want). If you’re stuck in a dormitory without a gas stove, this means getting an induction cooker, which is also rather cheap, though you need to make sure your cookware choices are all compatible with an induction cooking surface. Thankfully, the last three items on my list are all very cheap in China, provided that you’re not dropping big bucks for imported cookware and cutlery. Overall, this investment in a working kitchen can prove challenging to short-term or cash-deprived expats and may deter them from home cooking, though expats in China for the long haul will see benefits to cash flow after a few months. The benefits are especially obvious if one learns to cook Chinese food that uses less exotic ingredients than, say, the cayenne-seasoned jalapeño bacon cheeseburgers I’ve been making for lunch this month. Finally, I’ll end this post with a couple examples of home cooked dishes most expats could make in China. 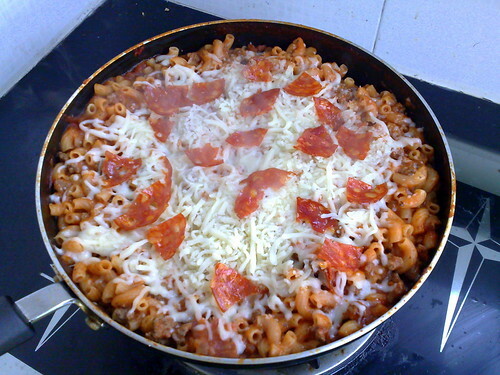 This is a recipe I nicked from a Hunt’s spaghetti sauce can — “macaroni skillet pizza.” Ingredients are canned spaghetti sauce, macaroni, ground beef, pepperoni, and mozzarella. Because it uses so many imported ingredients, this dish is slightly expensive to make, around 20 RMB per serving, with five to six servings per skillet. 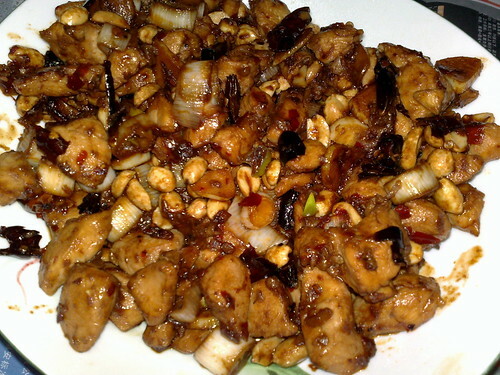 The second dish should be more familiar to anyone who eats Chinese food — kung pao chicken. The main ingredients — chicken breasts, scallions, dried red peppers, and peanuts — are pretty cheap but you still need to have some special sauces and rice wine on hand prepare it. In close, with a little patience, the right tools, and the willingness to experiment, home cooking can become part of an expat’s lifestyle in China. It may even save them money in the long run. * I swear to God this is the only Liu Xiang joke I’ll make this year. ** One exception I’ll make to frowning on frozen foods is Long Fong brand dumplings. I’m terrible at making dumplings myself, and these are the best-textured, best-tasting frozen dumplings I’ve tried, and if they want to send me money for saying nice things about them, they can contact me by email. According to government plans, the Tianjin metro will expand in the coming years to offer a total of nine lines offering connectivity throughout the city and between Tianjin and outlying regions in the Binhai New Area, giving Tianjin one of the most advanced metro systems in China. 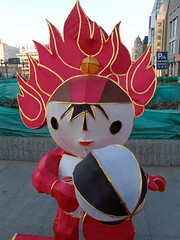 Lest I be accused of excess Tianjin boosterism, there’s a big “but” coming. Though the first line has only been open for a year and a half, Tianjin’s subway seems to be running into serious maintenance problems. 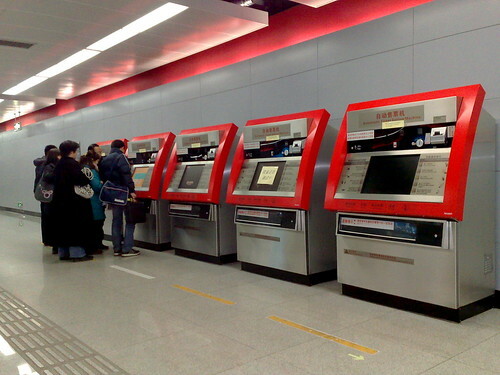 Like most modern subways, Tianjin’s subway uses a token system and automated token kiosks. Starting last year, the token kiosks began to periodically go on the fritz at every station in the city. When one kiosk breaks down, it’s not a big deal, but when four out of five kiosks are marked “out of order” at a station, as was the case in the photo below, one begins to wonder where the corners were cut when installing the system and just how reliable the infrastructure will be when lines two and three open in the next two years. Starting this month, Tianjin’s taxi companies have begun to upgrade their taxi fleets in advance of the Olympics. 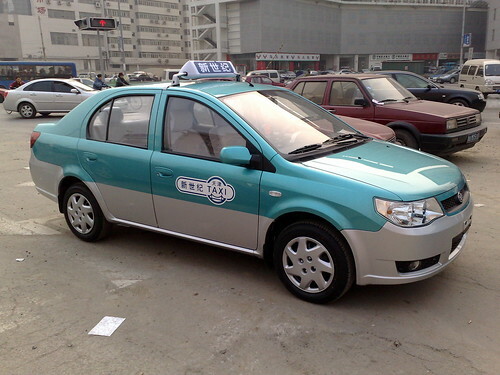 The new taxis, like the one shown above, are all new cars painted in a teal and silver two-tone color scheme that recalls the design of Beijing taxis. 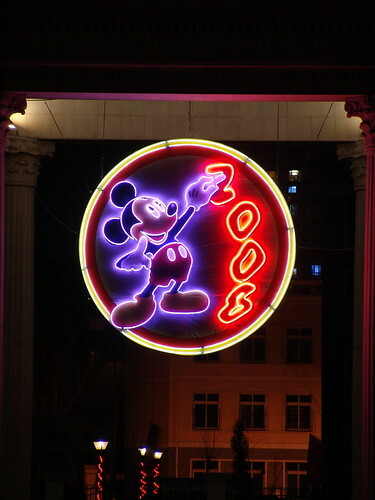 A bridge logo on the side of the taxis is based on Liberation Bridge, an old Tianjin landmark. Like Beijing’s recent upgrade to a mostly-Hyundai taxi fleet, the new taxis are intended to enhance Tianjin’s image. Most of the new cabs will be Toyotas or Velas (a make of Tianjin’s First Autoworks), but presumably other large taxis like Hyundais and Volkswagens will stay on the road. However, most taxi drivers are still in old Xialis (a compact sedan based on a Toyota design), and will need financing help from their companies to obtain a new car. I’ve been in Tianjin for four years and this is the third time Tianjin taxis have been upgraded. The first round of upgrading involved decommissioning hundreds of Huali minivan taxis, banana-yellow deathtraps that were good for carrying bicycles or moving house but not much else. The second round of upgrades involved switching the old analog meter and manual invoice system to automated digital meters with ticket printouts ala Beijing and Shanghai. After the third round of upgrades is finished this year, Tianjin will have a lot of bright shiny taxis on the road, but one aspect of the taxi service will still need improving — taxi drivers. Tianjin has some affable and reliable drivers to be sure, but there are still too many cheats and lowlife drivers on the road. For instance, after the new meters were installed, some drivers began to place black electricians’ tape over the minute and kilometer counters so that victims, er, passengers cannot predict fares or know when they are being cheated. Also, as is the case in many large cities in China, taxi teams parked at major locations like shopping centers, the airport, and the train stations will cheat their passengers by taking longer routes, demanding money up front, or simply refusing to take people. Finally, unlike their Beijing counterparts, almost no Tianjin taxi drivers can speak English. This is not a problem for me but for the lazy expat or tourist, getting around can be a chore. 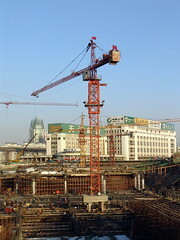 Since early this year, Tianjin’s main station has been closed for a massive reconstruction project that will increase station capacity as well as add light rail and subway lines. When finished, Tianjin will arguably have a better metro rail system than Beijing, though the capital will still surpass Tianjin in bus and taxi service, not to mention the number of rail connections going out of the city. 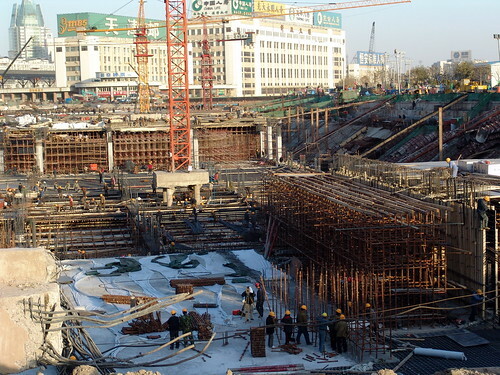 For now, the once and future Tianjin Station is encircled by a giant, rebar-filled pit. The old station, which has yet to be torn down, sits in the center like a medieval castle protected by a moat. The sheer size of the pit — roughly fifty feet deep, more than a hundred feet wide, and almost a kilometer long — made me recall Manufactured Landscapes, a documentary that showcased photographer Edward Burtynsky as he chronicled massive man-made environmental changes throughout China. This Saturday I snapped a couple shots of the construction work at the station while picking up tailored shirts at the Longmen textile market next to the old station, which is still open for business despite resting on the edge of the proverbial abyss. Without climbing to an elevated position to shoot, I can’t quite capture the size of the construction, though these photos give some idea of the scale and look of the place.